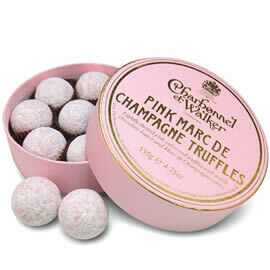 Charbonnel et Walker of Bond Street in London, are one of Britain’s earliest chocolatiers founded in 1875. World famous for their chocolates and truffles Charbonnel et Walker are endorsed by the Royal Warrant as chocolate manufacturers to Her Majesty The Queen. 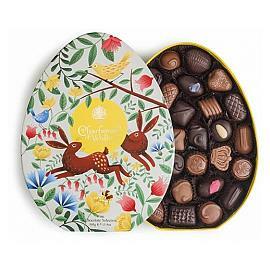 A selection of fine milk and dark chocolates presented in an Spring themed box, the Charbonnel et Walker Fine Chocolate Selection Easter Egg Shaped Chocolate Box. Charbonnel et Walker Pink Marc de Champagne Chocolate Truffles, a selection box of strawberry flavoured chocolate truffles in a large pink box. 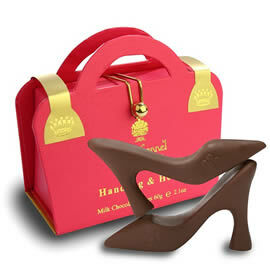 Charbonnel et Walker Chocolate High Heels, a pair of miniature chocolate stilettos presented in a gold embossed box designed to look like a handbag. A mini, red, heart shaped chocolate box with three Charbonnel et Walker Milk Marc de Champagne Chocolate Truffles inside. A large heart shaped chocolate box filled with Charbonnel et Walker Pink Marc de Champagne Truffles, a romantic chocolate gift for a loved one. 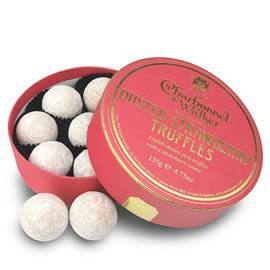 Charbonnel et Walker Dusted Strawberry Truffles. 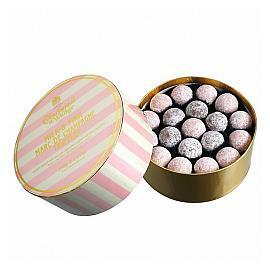 delicious white chocolate and strawberry truffles dusted with icing sugar. Charbonnel et Walker Milk & Pink Champagne Truffles, a large pink and white striped box with milk chocolate and pink Marc de Champagne chocolate truffles. 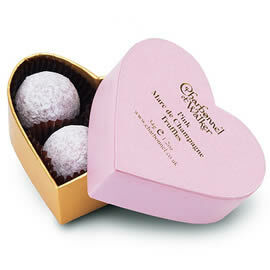 Charbonnel et Walker Pink Heart Chocolate Truffles Box, a cute heart shaped pink box containing three Charbonnel et Walker pink Champagne chocolate truffles. Charbonnel et Walker Pink Champagne truffles, strawberry flavoured chocolate with a milk chocolate, butter and Marc de Champagne centre. Charbonnel et Walker Marc de Champagne milk chocolate truffles, rich chocolate ganache made with butter and Marc de Champagne. 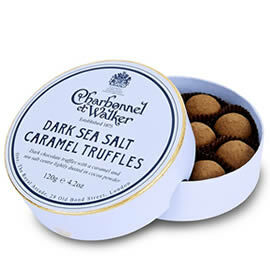 Charbonnel et Walker Dark Sea Salt Caramel Chocolate Truffles, luxury dark chocolate truffles with a caramel and sea salt centre, dusted in cocoa powder. Charbonnel et Walker Marc de Champagne Chocolate Truffles, a large round box of Charbonnel et Walker's classic Champagne chocolate truffles. 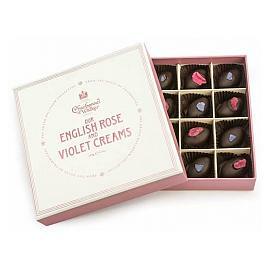 Charbonnel et Walker English Rose And Violet Creams Chocolate Box, dark chocolate covered fondants flavoured with rose and violet. 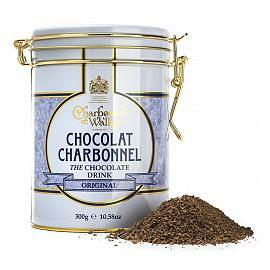 A very popular choice and appealing to those preferring a sweeter, 51% dark chocolate without any bitterness, Charbonnel et Walker The Chocolate Drink. 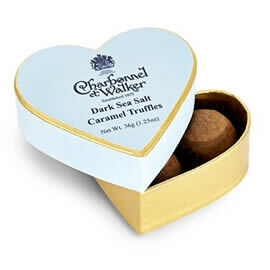 A small heart shaped box of dark chocolate truffles with a caramel and sea salt centre form Charbonnel et Walker. 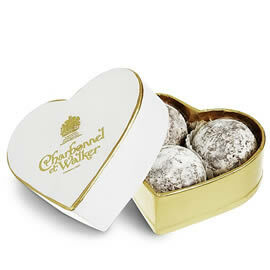 Charbonnel et Walker are famous for their chocolate truffles in their signature round chocolate boxes. 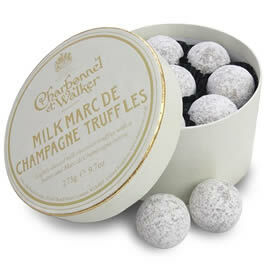 Charbonnel et Walker chocolate truffles are available in two main types; Marc de Champagne truffles and flavoured truffles. 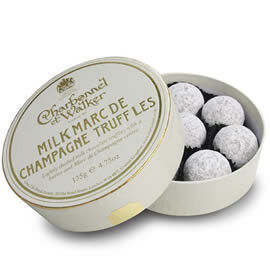 Milk Chocolate Marc de Champagne Truffles: Presented in a white box, these are the most popular Marc de Champagne chocolate truffles, milk chocolate dusted with powdered sugar. 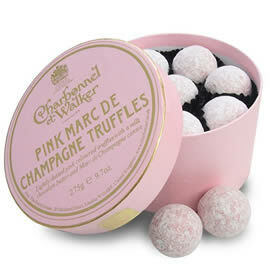 Pink Marc de Champagne Truffles: Also milk chocolate, but with white chocolate and strawberry, presented in a pink box. Dark Chocolate Marc de Champagne Truffles: Made with just dark chocolate and dusted with cocoa powder, in deep brown boxes. Along with the Marc de Champagne truffles Charbonnel et Walker also create luxury chocolate truffles with added flavours, classic chocolate combinations and special limited editions. Strawberry Chocolate Truffles: Milk and white chocolate truffles flavoured with strawberry. 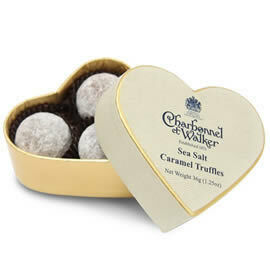 Sea Salt Caramel: Milk chocolate truffles with a soft caramel and sea salt centre, dusted in icing sugar. 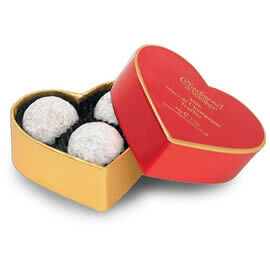 The Kings Ginger Chocolate Truffles: Dark chocolate truffles with a ganache centre infused with Kings Ginger liqueur. The chocolate truffles are available in a variety of different chocolate boxes; the classic chocolate truffle box is round and holds eight chocolate truffles inside, a selection of the Marc de Champagne truffles are also available in the larger, round double layer, sixteen truffle boxes.